2D Primary software offers genuine CAD/CAM experience, practical strategies for teaching number, measurement, shape and transformation and above all, fun. There is no doubt that Secondary Schools and Colleges comprise the largest customer base for TechSoft products. Universities come a close second but we continue to be delighted to be able to supply software and hardware for Primary Schools. The KS2 curriculum has, perhaps, been battered by Government initiatives more than most and D&T has certainly felt the pinch. Despite this, there is some excellent D&T work going on and we often present to groups of Primary colleagues to demonstrate what can be done using 2D Primary software and some simple but highly effective CAM machines. 2D Primary has been developed from its ‘mothership’ TechSoft 2D Design. Once our new 2D Design V2 software had bedded down, we were anxious to make sure that 2D Primary quickly followed suit. This latest version provides all the drawing and digital image tools younger pupils are likely to need. It is (for sure) an excellent tool for presenting accurate, dimensioned drawings but it goes further than that. These drawings can then be output to CAM machines or opened in 2D Design at a partner secondary school for output to more sophisticated machines. This has often been the basis for very productive cross-phase liaison projects. At its heart, 2D Primary is all about using geometry and this fits well with a cross-curricular, theme-based approach to learning. Maths specialists are quick to realise the potential this has for very practical strategies for teaching number, measurement, shape and transformation. From an ICT perspective, 2D Primary is unlike any other software children are likely to use. Most draw or paint packages create images with pixels – good for illustration but images can only end up as ink on paper. 2D Primary is vector based meaning that, below the surface, everything you see on screen has numerical data behind it. This is important – it means that drawings can be scaled, dimensioned and used to drive machines. It is a very important aspect of computer control. If this all seems rather ‘worthy’ then the great thing is that real CAD/CAM like this is great fun, highly motivating and a means to fuel creativity. 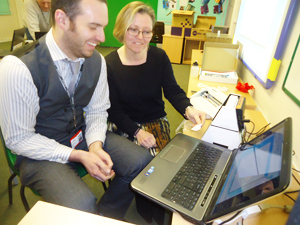 One school to embrace the potential of CAD/CAM for KS2 pupils is Westfields Junior School in Yateley, Hampshire. Headteacher, Karine George has a strong but simple philosophy for the place of ICT in her school. It has to have the greatest impact on children’s learning and be enabling, real,relevant, motivating and simple for staff and pupils to use. ICT has no place at Westfields as a subject – it is woven into every facet of the school curriculum. It is clear that Karine’s ideas are paying dividends.Awarded ‘Outstanding’ by Ofsted; Westfields has received National recognition for its work in ICT in particular. The school regularly shares good practice with visitors from all key stages and hosts learning walks, training and discussions for teachers and education professionals. The photograph here was taken at a twilight session we ran for the staff to get them up to speed with the technology. Westfields were among the first to buy a Primary Package from TechSoft which comprises a Site Licence for 2D Primary, a Roland Stika knife-cutting machine and the new Roland iModela mini-milling machine. It is early days in their journey with CAD/CAM but one that we will be following with great interest.